SAN FRANCISCO--(BUSINESS WIRE)--Jul. 20, 2016-- Visa Inc. (NYSE:V) announced today the full Team Visa roster for the Rio 2016 Olympic Games. 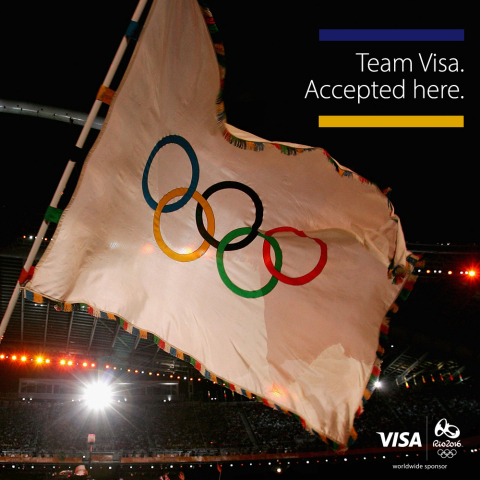 With 60 athletes, it is the most expansive group of Olympic and Paralympic athletes that Visa has supported to date. Anjeline Nadai Lohalith (Refugee Olympic Team, Athletics): Lohalith fled her home during war and joined the Tegla Loroupe Peace Foundation (“TLPF”) last year, where she now trains. She will compete in the 1500m distance event. James Nyang Chiengjiek (Refugee Olympic Team, Athletics): Chiengjiek fled to Kenya’s Kakuma Refugee Camp in 2002. More than 10 years later he joined TLPF to train, and will compete in the 400-m distance event. Paulo Amontun Lokoro (Refugee Olympic Team, Athletics): Lokoro escaped to Kenya’s Kakuma Refugee Camp and now trains at the TLPF in Nairobi. He will compete in the 1500-m distance event. Rami Anis (Refugee Olympic Team, Swimming): Anis and his family fled to Belgium to escape civil war and to find a safe harbor for his training. He will compete in the 100-m butterfly. Yolande Bukasa Mabika (Refugee Olympic Team, Judo): Mabika began practicing Judo as a child living in a refugee center in Kinshasa (DRC). After the 2013 World Judo Championships, she relocated to Brazil where she continues to train and live. Yonas Kinde (Refugee Olympic Team, Athletics): Kinde is a professional marathon and cross country runner. He is training in Luxembourg; he will be running the marathon in Rio. Earlier in the countdown to Rio, Yusra Mardini (Refugee Olympic Team, Swimming) and Raheleh Asemani (Belgium, Taekwondo) were named to Team Visa. Mardini will compete as a swimmer on the IOC’s team of refugee Olympic athletes after her courageous journey from Syria to Berlin, where she continues to train. Asemani will compete in Taekwondo representing Belgium. Team Visa athletes are at the heart of Visa’s global Olympic Games sponsorship activation, this year more than ever. Some examples include: Ibtihaj Muhammad (USA, Fencing), the first Muslim American woman to compete at the Olympics in a hijab, who unveiled the Visa payment ring to the world; Terezinha Guilhermina, (Brazil, Paralympic Athletics), the world’s fastest blind woman, who along with Mabika and Misenga, was onsite to open the Rio 2016 Copacabana Megastore in Brazil to make the ceremonial first payment; and Ashton Eaton (USA – Decathlon) and English Gardner (USA – 100m), who participated in Visa’s first Team Visa Facebook Live Stream last week.